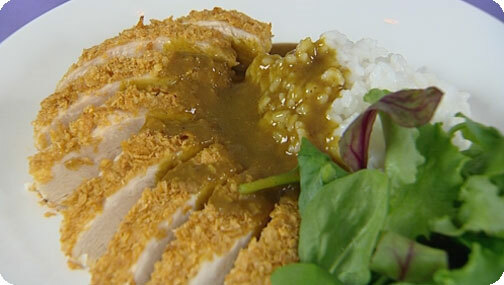 Serve with Japanese steamed rice and salad. Heat the oven to 200C. To make the sauce, heat the oil in a small pan. Add the onion and garlic and sauté for 2 minutes, then throw in the carrot pieces and cook slowly for 10 minutes, with the lid on giving the odd stir occasionally. You want to sweat the vegetables until softened and starting to caramelise. Meanwhile, get on with the chicken. Lay the seasoned flour, egg and cornflakes on to separate plates. Coat the chicken breasts into the flour, then the egg and finally cover with the cornflakes. Spritz with oil then put in the hot oven for 12-15 minutes. Slice the chicken diagonally then serve with Japanese steamed rice and salad.